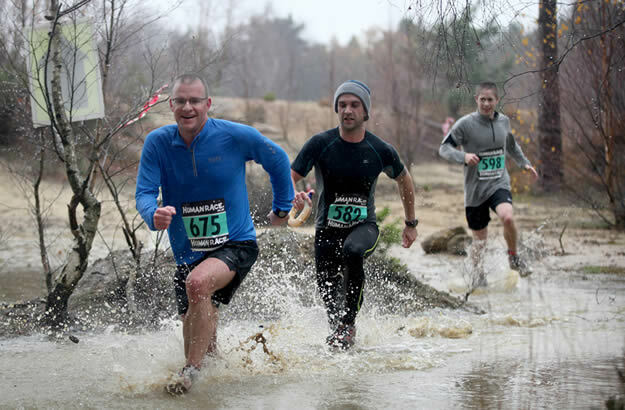 A new venue and course for the Wildman combined with challenging conditions provided a tough start on Saturday to the Human Race Off Road Race Series for 2012/13. The first event, WildMan kick started the Off Road Race Series for 2012/13 this weekend. 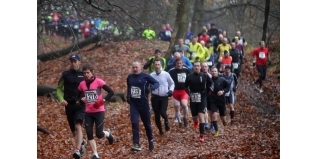 Race organisers, Human Race were pleased to have almost 700 entrants for the first event of the five-race series held at Ash Ranges near Aldershot. WildMan saw competitors take on either a 10km or 15km trail run, or a challenging off-road duathlon consisting of a 10km run, 18km bike and a final 5km run to really test the legs. Hundreds of trail runners were first to head off in a mammoth swarm but it only took a handful of twists and turns for the group to thin out as the lead runners shot off through the trees. The off-road course would not be complete without the hills, mud and the unknown (…of what is in store around the next corner!) and the WildMan trails did not disappoint. Taking full ownership of the 10km distance was Jonny Dry who set out with great determination and had the ultimate performance finishing in just 43.13. And his surname was quite the opposite of his finishing appearance! Ben Meakin secured second, crossing the line in 44:44 and Sam Reed came in third in 46:26. Finishing in first place in the 10km for the females was Katie Fleming in a time of 53:26 followed by Emma Butcher in 56.03. Charlotte Hanson took the final prize, third place in 58:09. In the longest trail run, the 15km, Joe Morwood held his own throughout the race finishing in 59:18. As a local resident of Ash Ranges, Morwood is accustomed to the terrain; “This is where I do all my training so I was very prepared for the hill climbs and winding tracks. I'm very pleased that a race is finally being held in this area, I certainly did not want to miss it, and it did not disappoint!” Morwood was closely followed by Kevin Quinn who took second place in a time of 1:00:01. A familiar face from the 2011/12 Off Road Race Series, Joe Croft placed third in a time of 1:02:32. Fiona Love of Clapham Chasers carried momentum right through the finish line of her 15km to claim first place for the females in 1:14:22. Thames Turbo athlete, Louisa Vere placed second in 1:23:18. Heike Godwin had Alison Gordon hot on her heels but managed to step ahead to take third place in a time of 1:23:36 and Gordon narrowly missing out by 6 seconds. Newly added for the 2012/13 Off Road Series is the trail run leader board. The top 50 trail runners, of the longest distance, will tally up points at each Off Road event for prizes and the ultimate title ‘Off Road Race Series Trail Run Champion'. As the trail runners started to clear the course the duathletes continued their battled through what was now heavy rain and low temperatures. Not to mention the boggy terrain underfoot that the athletes had to contend with; this was not a race for the faint-hearted! The opening run leg was lead by Cedric Lassonde (TriUK) with Tom Robertson and Phil Holland (Ampthill and Flitwick Flyers) keeping him insight. The technical bike course, claimed by many finishers as the toughest element, saw Paul Davies and Philip Westoby (Army Triathlon Association) come into the picture and placed in second and third with Holland hanging on to them in fourth. It appeared to be an over zealous start from Robertson who now placed sixth. Maintaining the top spot from start to finish, Lassonde powered through the swamp and straight to the finish line in 2:08:57 an impressive five minutes ahead of any other competitor. Making it his second consecutive win at WildMan, Lassonde said “It was very different from last years WildMan course, the mixed terrain is great”. Tearing back to second place, was Holland crossing the line in 2:13:05 followed by Westoby who ran out a steam to challenge Holland and settled for third in 2:13:21. Davies just battled for survival on the final run leg as his hamstrings seized so placed fourth, missing out on a podium spot by just 16 seconds. In the corresponding women's event, the field was again led by one individual. Juliette Clark, a well-trained athlete, however has been away from the racing scene for around 10 years. Despite the minimal racing and this being her very first off-road duathlon race there was no sign of lack of confidence. The first 10km run saw Clark, Samantha Aplin and Hannah Ross-Tatam all place as they entered transition. As in the men's race, the bike course saw two new faces join the top table, this time, Vicky Daleman (B2P Tri Club) and Charlotte Winton. With no sign of Daleman and Winton on the final run leg, second and third place were up for grabs. Clark had secured the top position with a 5minute+ lead and crossed the finishing line with a huge grin in 2:56:37. As she described, “It was a gruelling yet hugely enjoyable race.” - An encouraging start for Clark who may start to consider becoming a regular off-road racer. Aplin was next across the line in 3:02:10. Sarah Whelan who appeared to have a slow start, judged the race well and had enough left in the tank to bag herself third place in 3:04:47. Next up, the Off Road Race Series heads to Camberley for MudMan on December 8th. Entries are open now at www.humanrace.co.uk.